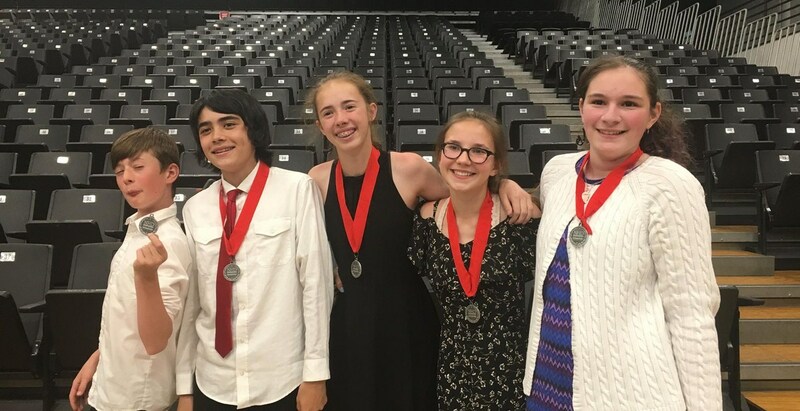 Sitting around the conference room table in Escalante Middle School are the five students that qualified for the national competition in National History Day. They are so pumped on history and their research projects, that the air practically sizzles with excitement as they describe their topics and how they addressed this year’s theme of Conflict and Compromise. Each year more than 500,000 students across the country compete in National History Day, which aims to encourage critical thinking, problem solving skills, research skills, and inspire students through the study of the past. It’s clear with these Escalante students that are full of inspiration and have put these skills to the test. 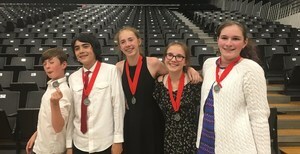 While all of the students had participated in National History Day in years past, this is the first time that Akiva Kim, Charlie Shepherd, Ariana Keuski, Lindsey Johnston, and Diana Gottlieb have qualified for nationals. Only the top two projects in the categories of Exhibit, Paper, Website, Documentary, and Performance move on from the state competition to nationals. Akiva Kim and Charlie Shepherd finished second in the documentary category with their film on Mahatma Gandhi. They addressed the conflict side of this years theme, by focusing on the non-violent techniques and protests that Gandhi employed to in the fight for India’s independence. They both had some previous experience creating their own movies, including videos they created on the brain for school. Each brought their own talent to project with Charlie preferring the script writing aspects of the project, and Akiva utilizing his love of editing. They both were impressed with Ghandi’s perseverance and ability to remain peaceful and non-violent when faced with conflict. Both had created websites previously, and thought that a website was the perfect medium to showcase the influence that the Hart-Cellar Act had on immigration in the United States. “The Hart-Cellar Act impacted our immigration laws the most, and it has improved since the Act, “ said Ariana. “I didn’t understand how immigration worked before the project. I learned that the Act created a more accepting immigration system,” said Lindsey. The duo used their website to show how the Hart-Celler Act was a compromise that reunited families and attracted skilled labor to America, and how as a result of the removal of national quotas the country became more culturally diverse and innovative. Diana Gottlieb’s paper on Clair Patterson and lead poisoning titled “No Compromise: The Accident that Became Patterson’s Revolution” garnered her a spot at nationals with a second place finish at state. She explored the conflict between Patterson and the auto industry and how his unwillingness to compromise dramatically decreased public exposure to lead and lead poisoning. She first learned about Patterson while watching tv. What impressed her most was how he refused to compromise, and was unwilling to give up, continuing to fight for gasoline companies and the auto industry to not use lead in fuel. His tireless dedication to his work eventually led to the removal of lead in gasoline, paint, and toys. “He spent his whole entire life after college on this. The message for me was do whatever you want. No one can stop you,” said Diana. The students will travel to the University of Maryland in College Park on June 10th to compete at nationals. After hearing about the success of these students at state, an anonymous donor has graciously offered to pay for the trip for all five students.